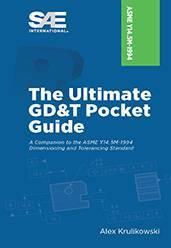 Truly the Ultimate Pocket Guide on GD&T, this informative guide is the perfect on-the-job pocket reference for your GD&T needs. It's an economical reference tool you can't afford to be without and a must for anyone who uses engineering drawings. It's a must for anyone who uses engineering drawings. Order one for each member of your team! If you do not have access to SAE MOBILUS via username/password or institutional access, you can still purchase the Book, Ultimate GD&T Pocket Guide - ASME Y14.5-1994.